Volkswagen’s Dieselgate scandal led to the indictment of nine employees, including its former CEO, but a court-ordered settlement required the German automaker to dump gobs of cash into electric vehicles. When it comes to fast charging infrastructure, we’re now seeing what the investment might look like. Electrify America, the electric vehicle charging unit of VW, introduced a map this week of planned charging stations across the U.S. VW launched the effort as part of a $2 billion settlement with the U.S. Environmental Protection Agency and California Air Resources Board over the long-running diesel-cheating scandal. 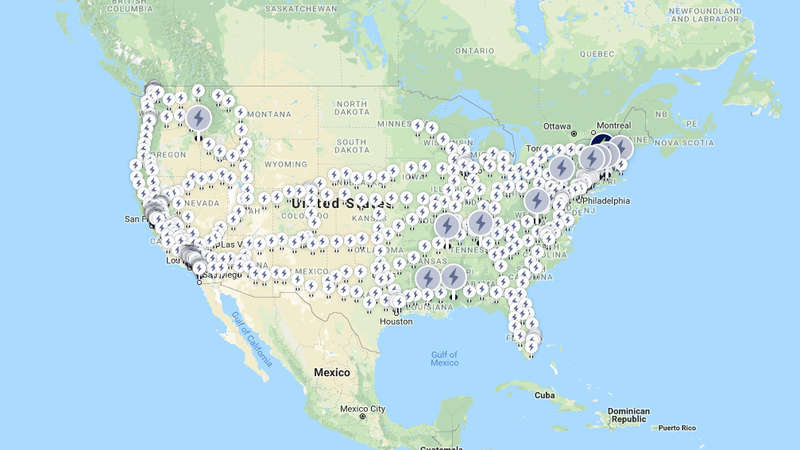 Electrify America says it ultimately plans to build more than 2,000 chargers at 484 sites across the U.S., and it plans to have them either constructed or under construction by the end of 2019. The systems will have a capability of up to 350 kW for stations located along the highway. Metro locations will have chargers ranging from 50-150 kW. Every station will have a CHAdeMO1 50 kW connector. As Electrek pointed out, exact locations haven’t been confirmed yet, but the routes highlighted here are the planned locations for the “ultra-fast” charging stations. Electrify America announced last month that it plans to install fast chargers at 100 Walmart locations in 34 states by mid-2019. All told, it’s one of the first signs that automakers are coming to grips with the reality that, if they want to succeed in introducing electric cars into the world, they either need to finagle a deal to sync up with Tesla’s already robust Supercharger network, or build out its own infrastructure.